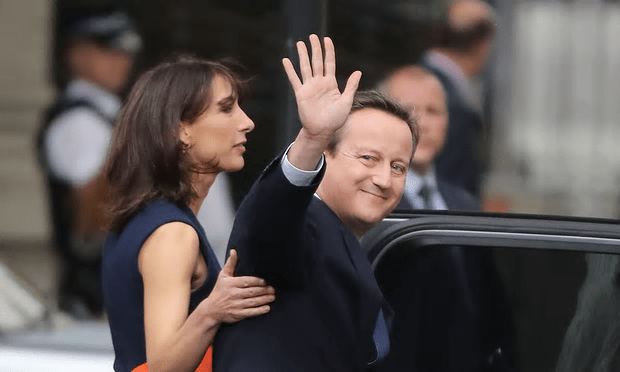 Good riddance: David Cameron with his wife Samantha left 10 Downing Street for obscurity on Wednesday [Image: Christopher Furlong/Getty Images]. This is typical of the “one rule for us, another rule for them” behaviour that is epidemic among Conservatives. Think of, say, council workers who have been laid off and then re-hired for lower pay because the authorities have been given less money (in real terms) every year under David Cameron and can no longer afford to pay the original rate. If they were to lose their jobs again, would they be paid more because they had lost the severance benefits associated with their previous contracts? No! But Cameron gets away with giving a golden handshake to his chums. Perhaps he’d think again if this cash was taken from his own pay, but that would never happen either. David Cameron demanded that his closest aides receive boosted redundancy pay in one of his last acts as prime minister, overruling Whitehall guidance. On his last day in office, the outgoing prime minister handed his advisers six months of pay instead of the four and a half months stated in their contracts, taking the total bill for their departure to £1m. Manzoni said he recognised “this is a difficult time for the individuals” and noted that “there had been an expectation amongst some that their severance sum would be higher, which has led to some disappointment”. The special advisers raised concerns because, despite in several cases having worked in Downing Street since 2010, they were “reappointed” after the general election last year. This reduced their payouts, because the election was just over a year ago. would ignore what they have been told to do greed goes deep. All smug and greacy with a smile on his face no one mentions the deaths of all the poor people his & IDS reforms had done all to save money! !! Proves they are only interested in the tax payers money, dodgy Dave and his cohort took everything from those who are less able to afford it. But now they have gone forever after being proved the worse PM&Chancellor ever to have been in charge of our Great Britain. SPADs work for both sides an I feel for them whenever anyone resigns or leaves office early. We should though treat them all equally.